Dinner at 8:30 pm. Presentations begin earlier at 6:30 and continue later at 9:30 pm. The event is free, but please do bring something to top your pancakes! On Thursday, December 11th, at 8pm explore 10,000 years of grain at Flux Factory with a time-traveling pancake potluck dinner. Pancakes will be made with einkorn, one of the earliest cultivated grains; Kernza, a perennial grain currently under development at The Land Institute in Kansas; and Corn flour, a contemporary staple grain. 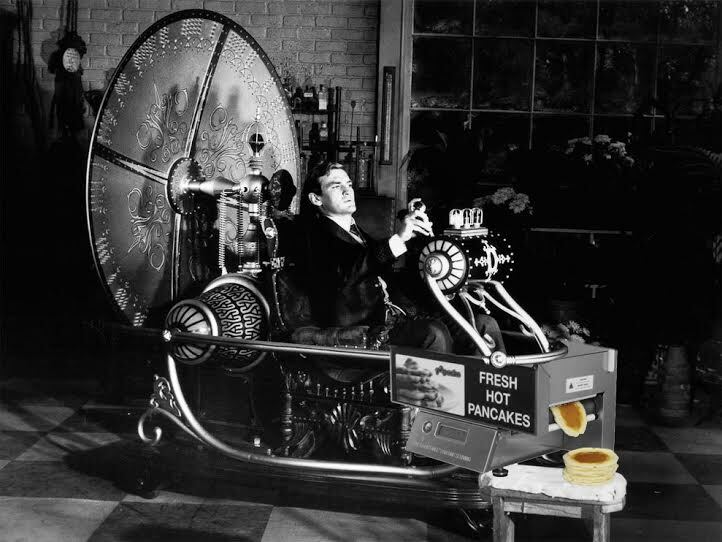 Bring a historical or futuristic tasty topping to enjoy with pancakes. Join us before, at 6:30, and after dinner to discuss Kitchens & Capitalism which examines the way different types of kitchens resist and/or replicate capitalism. The exhibit will collect drawings, models, diagrams and stories of different kinds of kitchens: historical, home, collective, and industrial. Performances and workshops will examine ways of performing the kitchen and how our performances of the kitchen shape our worldview. As part of our research we will map and remodel Flux Factory’s collective kitchen. Kitchens & Capitalism involves Walker Tufts, Emily Ensminger, Greg Stewart, Carina Kaufman, Grace Amber, Hannon Welch, Will Owen, Athena Kokoronis, and others. This project is partially funded by Foundation for Contemporary Arts Emergency Grant with special thanks to The Land Institute. Flux Thursdays are supported by the Department of Cultural Affairs and the New York State Council on the Arts.